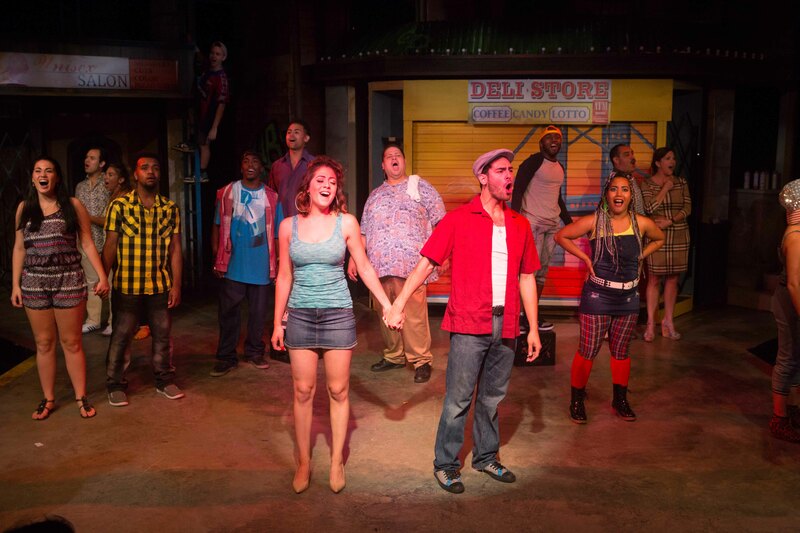 EXTENDED Thru Dec 3 “In The Heights” (Porchlight Music Theatre): Community Anchored in Heart and Humor! 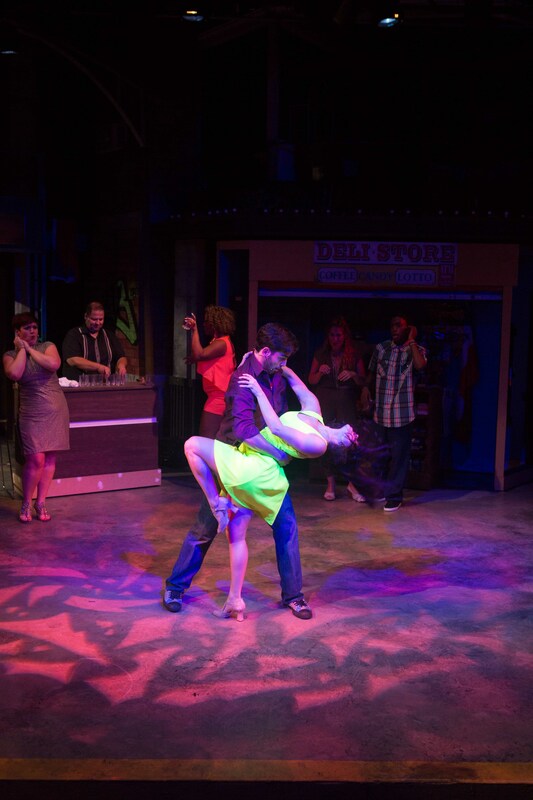 Porchlight Music Theatre presents the multi-Tony Award-winning IN THE HEIGHTS. Community! This community is bursting with the loving ties of people joined together by their similarities as well as their differences. From the moment I sat down, I saw the community in the detailed streetscape by Scenic Designer Greg Pinsoneault. The two-level multiple-building structure showcases the struggling storefront businesses on the ground and the cozy residential nooks above them. The graffiti enhanced visual depicts NYC’s Washington Heights in July 2008. We’re immediately transported to this gritty neighborhood by Pinsoneault. His urban backdrop mirrors a small corner of life that many may walk quickly past without ever thinking about its inhabitants. Lin-Manual Miranda (creator, music, lyrics) and Quiara Alegria Hudes (book) will change all that. Through their heartfelt musical story, we will meet this tight-knit community that struggle with poverty, identity, and makeshift families in each person’s quest for happiness. Director Brenda Didier masterfully choreographs, along with Christopher Carter, a vivid salute to this Dominican, Puerto Rican, Cuban, Mexican, Ecuadorian -American neighborhood. In the number “Carnaval Del Barrio”, flags representing the various ethnic origins are orchestrated into the high-energy stepping. In “The Club”, the talented ensemble sizzle with sultry latino dance moves. Throughout the show, break-dancing is even incorporated. The musical numbers are also dressed up in eclectic style by Costume Designer Kate Setzer Kamphausen. Her wardrobe choices enhance and define the individual personalities. From the homespun Isabel Quintero (Abuela Claudia) to the slinky Michelle Lauto (Michelle) to the full-on moxie of Missy Aguilar (Daniela), the clothes are a colorful storytelling tool. 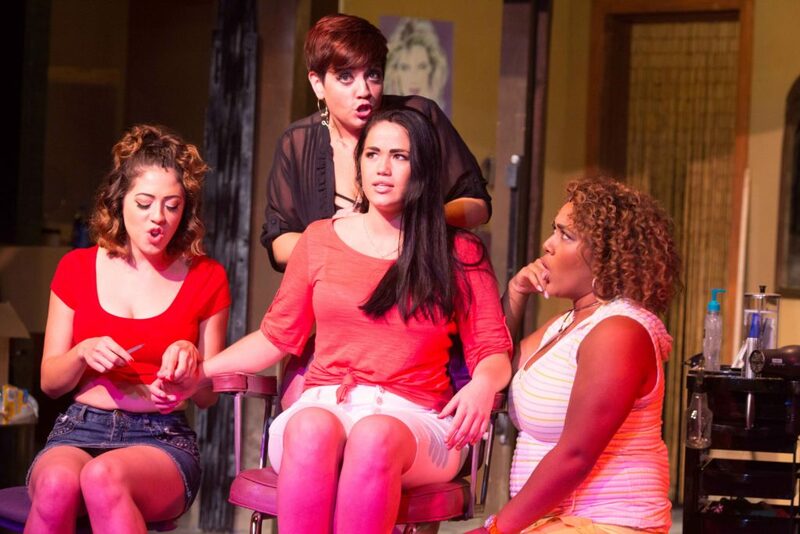 IN THE HEIGHTS is all about the harmony between people. The diversity in the dancing and the songs represent the acculturation of different cultures living together in a new country. Under the skillful musical direction of Diana Lawrence, the songs establish home and heart. The charismatic Jack DeCesare (Usnavi) brings the hip hop. He kicks off the show by rhythmically introducing the routines of his neighbors. Later, his fast-talking prose inspires the community for change. The rapping puts a contemporary spin on the musical yet, Miranda’s rich score is as diverse as the neighborhood. The lovers’ ballads, “Sunrise” and “When the Sun Goes Down” are sung with lump-in-the-throat perfection by Stephen Allen (Benny) and Lucia Godinez (Nina). On the flip side, the sassy beauticians, Augilar, Lauto and Leah Davis (Carla) amusingly sing about the latest gossip. These gals cackle with hilarity. And nod out to the snarky sidekick Frankie Leo Bennett (Sonny) for nailing the one liners. This community is brimming with character, aspirations and the weight of reality. They are struggling with the economic crisis. Within that dark hardship, their lives intertwine in a deep, vibrant tapestry of loving acceptance. 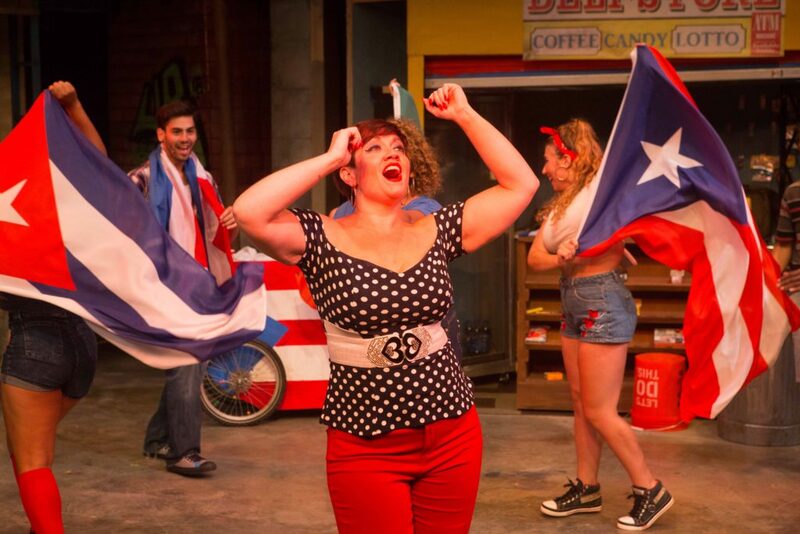 I thoroughly enjoyed IN THE HEIGHTS. I misted up three times visiting this community anchored in heart and humor. Whether you can get HAMILTON tickets or not, you should get tickets to this original, award-winning Lin-Manual Miranda’s musical. But better act quickly, performances keep selling out. Sunday, Nov. 20 at 2 p.m.
Monday, Nov. 21 at 7:30 p.m.
Friday, Nov. 25 at 4 p.m.
Wednesday, Nov. 30 at 7:30 p.m.
and Thursday, Dec. 1 at 1:30 p.m.